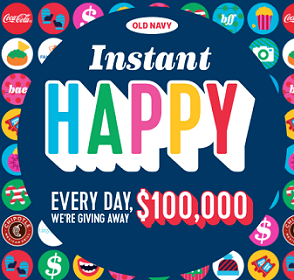 You can enter daily for a chance to win the Old Navy Instant Happy 2016 Sweepstakes! Ends November 25, 2016. Good Luck! 1. Make a Purchase: During the Entry Phase, visit an Old Navy store location in the U.S. and make a purchase to receive one (1) scratch off card. Once you receive your scratch off card, scratch the surface to reveal your prize. 2. Alternate Method of Entry: During the Entry Phase, visit an Old Navy store location in the U.S. and ask a store associate for one (1) scratch off card. Once you receive your scratch off card, scratch the surface to reveal your prize. Each Instant Win Game piece will contain a unique code. During the Redemption Phase, locate the unique code and visit www.oldnavy.com/RedeemHappy and follow the links and instructions to redeem your prize. Limit: Each U.S. entrant may redeem up to two (2) Instant Win Game prizes per day during the Redemption Phase regardless of method of entry; each Canadian entrant may redeem up to two (2) Offers per day during the Redemption Phase; each entrant may receive up to two (2) entries per day during the Sweepstakes Period regardless of method of entry. Sweepstakes Prizes: EIGHT (8) GRAND PRIZES (one (1) awarded per Daily Entry Period): A $100,000 check. Approximate Retail Value (“ARV”): $100,000 USD. (100,000) FIRST PRIZES: $25 off a Tiny Prints purchase awarded as a code. ARV: $25 USD. (5,000) SECOND PRIZES: A Fandango movie ticket awarded as a digital code. ARV: $13 USD. (500,000) THIRD PRIZES: Free Chipotle chips and guacamole awarded as a digital code. ARV: $3.31 USD. (5,000) FOURTH PRIZES: Fifty-five (55) Coke Rewards that can be redeemed online for a free drink. ARV: $1.99 USD. (3,118,800) FIFTH PRIZES: An Old Navy free shipping code awarded as a digital code. Odds of winning a Fifth Prize are approximately 1:1.19.